The Cannes Film Festival, Cate Blanchett led, women led movement, pic. 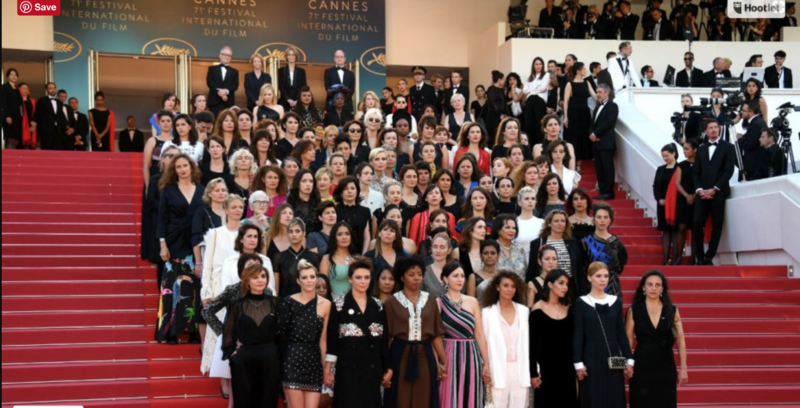 There are 82 women pictured here, they represent the 82 women who have served as stars or in leadership positions of movies that were featured in competition at Cannes…over it’s entire 71 years! “On these steps today stand 82 women representing the number of female directors who have climbed these stairs since the first edition of the Cannes Film Festival in 1946. In the same period 1688 male directors have climbed these very same stairs. In the 71 years of this world-renowned festival there have been 12 female heads of its juries. The prestigious Palme d’Or has been bestowed upon 71 male directors – too numerous to mention by name – but only two women – Jane Campion, who is with us in spirit, and Agnès Varda who stands with us today,” said Blanchett. “These facts are stark and undeniable. Women are not a minority in the world, yet the current state of our industry says otherwise. As women, we all face our own unique challenges, but we stand together on these stairs today as a symbol of our determination and commitment to progress. We are writers, producers, directors, actresses, cinematographers, talent agents, editors, distributors, sales agents and all involved in the cinematic arts. We stand in solidarity with women of all industries,” they continued, before reading out a list of demands. The video for his latest release ‘This is America’ has been viewed over 100M times on YouTube which obviously doesn’t count the bootleg industry. Violence between individuals and institutions, relationships: the video captures critical issues of violence amongst people and institutions. And, slowly, a personal controversy began to emerge. Donald Glover’s partner, mother of his two children is not African American…and therefore is he really legit to comment on the ‘issues’ that confront the African American community, seriously!!!! WTH! Donald Glover! a ‘black man in America!’, definitely, this man has the perspective that counts. Updates: we premiered the Chicago Made Shorts, an ‘offline’ event in Chicago May 3, 2018! Unbelievable event…the filmmakers in attendance were amazing! The online premiere of Brooks People on June 7, 2018 on itsashort.com, times: 9 eastern/8 central/6 pacific. The Short film Brooks People is about the Pulitzer Prize winner, Illinois Poet Laureate and ‘mother’ of hip hop, Gwendolyn Brooks. June 7 is her birthday. This will be an online ticketed event followed by a live streamed interview with the filmmaker Shahari Moore and others. Dorian Welch, an emerging filmmaker is premiering Hood UUBBer, his short film about ‘the hood uber experience’ or best Uber experiences. Unlike other premieres, this will be gamified…of course! Registration will open July 11 and the contest kicks off July 18. You must register and watch starting July 11 to participate in the game. The night before, Hood UUBBer will post the game questions and you will have 5 days to watch answer and submit. This being hood UUBBer…you will need to bring your best skills. We will live stream the prize award announcements and invite some of the best participants to join in the live stream.